It's quite easy to become complacent with CPU releases, viewing them as an exercise in marketing and massaging consumer perception rather than advancing performance. That's perhaps an unfair characterisation of the recent history of CPUs as a product segment, but it does capture an opinion that was pervasive only a few years ago. Now however something has lit a fire under Intel, and the mainstream segment is finally starting to see the gains possible when you brute force optimisations of efficient architectures into higher performance categories. Sadly this didn't occur when there was clear scope for shrinking to a smaller process. By most metrics, especially synthetic ones, the Core i9-9900K is an absolute beast of chip, gobbling through single- and multi-threaded benchmarks with aplomb thanks to Intel's big-core Coffee Lake architecture and monolithic die design. Reaching 5GHz on a retail product, even as a single-core Turbo mode, is a testament to both engineering and manufacturing expertise. That they were able - perhaps forced - to do this on an optimisation on an ageing 14nm manufacturing node is remarkable, and bodes well for the eventual shift to 10nm if they can progress that far in 2019. That both Power Consumption and Temperatures run high on the i9-9900K will be of little concern to the enthusiasts who purchase this CPU. The move to solder TIM over paste was clearly a necessary step; with a Corsair H110i it still ran at a toasty 73C under heavy load, rivalling HEDT processors of the past. Total system power draw meanwhile was only a little higher than the Ryzen 2700K, so clearly the platform as a whole has by no means taken a retrograde path in the last year. With performance verging on HEDT territory it's not surprising to see the logic of HEDT pricing. 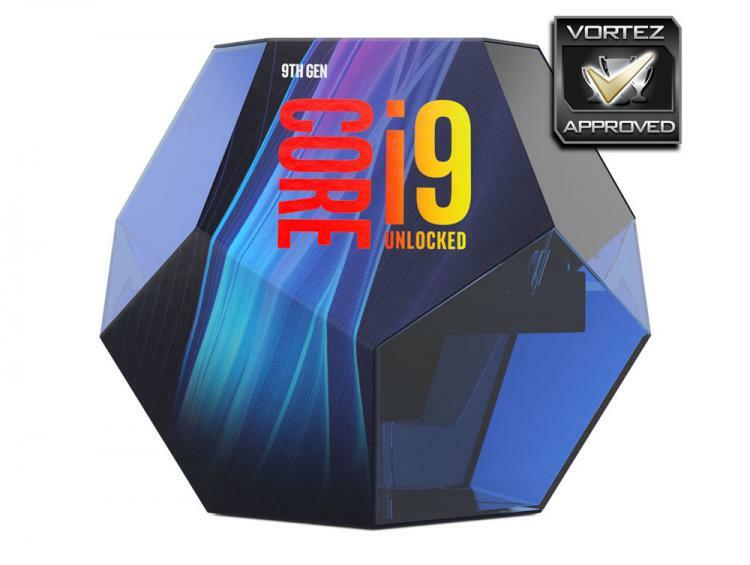 The i9-9900K matches 8-core Intel Skylake-X counterparts at ~£600, $530 USD or $859 AUD, and in many tests more than matches performance thanks to high clock speeds and dual-channel memory rarely being a drawback. Intel's issue will be the preemptive cuts made by AMD to the Ryzen 7 2700K; to be clear, the 9900K is broadly faster, but you'll really need to be stretching its legs in workhorse tasks to observe meaningful difference when you're more likely to be GPU limited in gaming. Enthusiasts will almost certainly be eager to get their hands on Intel's new flagship, especially if the mainstream Z370/390 is their platform of choice. In terms of core count it is forward-looking as Windows and game engines are finally beginning to adapt to more cores being available. Hopefully this is the sign of a lasting strategy from Intel, and perhaps a means of them to reinvigorate their approach to Moore's Law scale performance gains. When it comes to overclocking Intel's platform remains a breeze to work with from a tinkerer's standpoint. We overclocked our sample to 5GHz on all cores at 1.3v, and are confident that adept overclockers chasing benchmarks will be able to breeze through the barrier now that paste TIM is no longer an impediment. We should note that pushing beyond 1.3v did cause temperatures to rocket past 100C, so bespoke water cooling may well be the order of the day when running continuously at a high overclock. At the very least, there will be fewer CPU dies lost to delidding, thank goodness. All in all, the Intel Core i9-9900K is effectively an Extreme Edition chip for a new generation of enthusiasts, rather than a mainstream price/performance high watermark. No-one will ever be able to call it affordable, but those leery of the cost implications of moving to the HEDT Skylake-X platform now have a greater stake in the mainstream segment. Intel's reintroduction of solder TIM is welcome, although high temperatures and power consumption may mean that it was a necessity. If you're looking for the highest performing mainstream CPU this is it, but it would be best to consider very carefully the use you're putting your system to before making this investment over other components.